What's the best way to feed the world? Organic food? Local production? Genetically modified organisms? In the first-year seminar ES103: Environment & Sustainability: Food, Agriculture & Sustainability (Fall 2013), students asked these questions and many more. 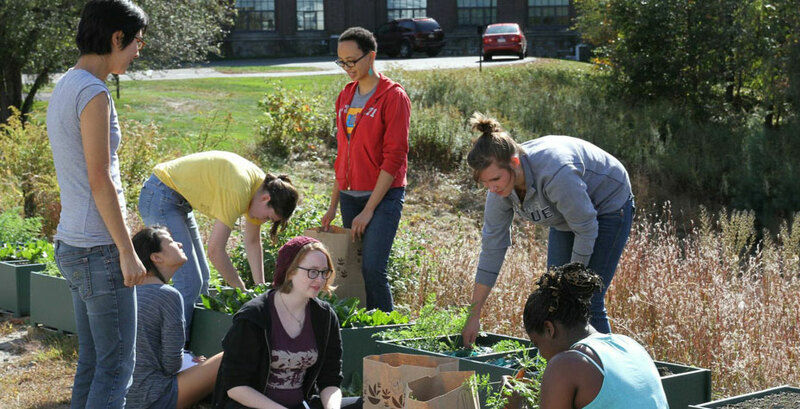 An average day might be spent out in the dirt, harvesting both organically grown and conventionally grown carrots from a "farm-in-a-box," or traveling to a local food pantry to learn about food access in the Boston area, or having a lively in-class debate about the ethics of meat consumption. Associate Professor of Environmental Studies Jay Turner emphasized an interdisciplinary, hands-on approach to studying some of the most pressing environmental issues of the day. ES103 is the first Spotlight on Teaching feature of 2014, a chance to highlight the array of innovative, thought-provoking Wellesley courses. Learn more about ES103, and look out for a new featured course each month.